The book of Hebrews has often been the Cinderella of the New Testament, overlooked and marginalized; and yet it is one of the most interesting and theologically significant books in the New Testament. 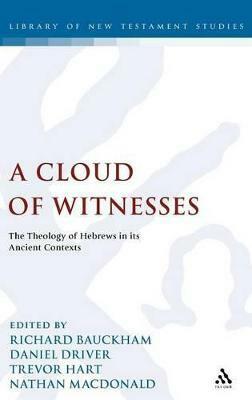 A Cloud of Witness examines the theology of the book in the light of its ancient historical context. There are chapters devoted to the structure of Hebrews, the person of Jesus Christ, Hebrews within the context of Second Temple Judaism and the Greco-Roman empire and the role of Hebrews in early Christian thought. Part 1: The Structure of Hebrews; The Structure of Hebrews: A Word of Exhortation in Light of the Day of Atonement; Hidden Stories in Hebrews: Cosmology and Theology; Part 2: Jesus Christ in Hebrews. Christos as Pistos: The Faithfulness of Jesus in the Epistle to the Hebrews; The Passion: Reconsidering Hebrews 5:7-8; "If Another Priest Arises": Jesus' Resurrection and the High Priestly Christology of Hebrews; The Eschatological World Already Subjected to the Son: The Oikoumene of Hebrews 1:6 and the Son's Enthronement Pioneer and Perfecter: Joshua Tradition and the Christology of Hebrews; Part 3: Hebrews, the Old Testament and Second Temple Judaism; "But We See Jesus": The Relationship between the Son of Man in Hebrews 2:6 and 9 and the Implications for English Translations Hebrews 7:1-10:18 and the Mosaic Law; The New Covenant and Christian Identity in Hebrews Melchizedek without Speculation: Hebrews 7 and Genesis 14 "The True Tent which the Lord has Pitched": Balaam's Oracles in Second Temple Judaism and in Hebrews; Pistis and Emunah: The Nature of Faith in the Epistle to the Hebrews. ; Part 4: Hebrews and the Roman Empire; The Anti-Imperial Rhetoric of Hebrews 1:3: Charakter as a Double-Edged Sword; Part 5: Hebrews in Early Christianity; Heb 5.7, Jesus' Prayer on the Mount of Olives and Jewish Christianity: Hearing Early Christian Voices in Canonical and Apocryphal Texts The Universal and Eternal Validity of Jesus' Priestly Sacrifice: The Epistle to the Hebrews in Support of Origen's Theory of Apokatastasis. Richard Bauckham is Professor of New Testament Studies, St Mary's College, University of St Andrews, UK. Trevor Hart is Professor of Divinity at St Andrews University, Scotland. Nathan MacDonald is Lecturer in Old Testament at St Andrews University, Scotland. Daniel Driver is a postgraduate student at St Andrews University, Scotland.